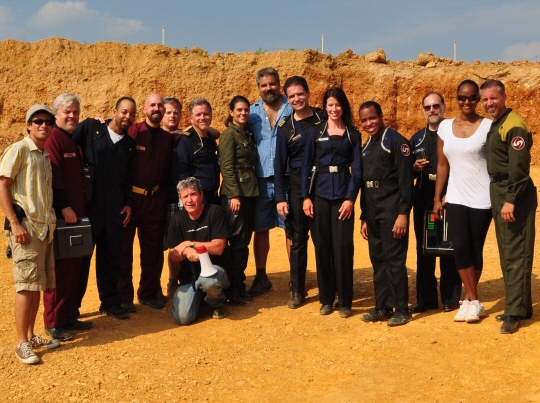 At approximately 4:30 PM on July 24th, 2011 - 594 days after we began - we wrapped principal photography on Polaris. The esprit de corps and commitment of the Polaris cast and crew continues to astonish and humble me. We started shooting early in the morning on Saturday and even earlier on Sunday, but by midday were fighting heat indexes in the 110-115 degree Fahrenheit range. Everyone gave their all, but the hero of the weekend had to be our craft services manager, Rick Pike. He was everywhere, setting up tents and umbrellas for shade, keeping us hydrated and fed and generally mother henning the whole troupe while keeping an eye out for anyone who seemed to be especially suffering from the brutal conditions. In between set-ups those who could were encouraged to retreat to air-conditioned vehicles for a little respite, but such opportunities were rare ones for much of the crew. These guys came through like champions to the end. We’re wrapped! On Saturday evening, courtesy of our film editor Maurice Molyneaux, everyone got to see about ten minutes of the show edited together for the first time. I think we were all proud of what we saw. Now we continue with post-production, reaching out to still more artists to create the musical score and visual effects that will bring the movie to completion. I’ll post more about that in the coming months. For now I can only say “Thank You” one more time to everyone who’s worked on this project - you guys are the best! Along with your skill and long hours, days and months of hard work you’ve given me respect, support and most importantly your friendship - far more than I could possibly have earned. I’ll do all that I can to live up to the standard of dedication and excellence you’ve set.